Thank you to all of the families, students, faculty, and staff who donated 129 bags of food for the Women's Way and United Way Supper for Six program! 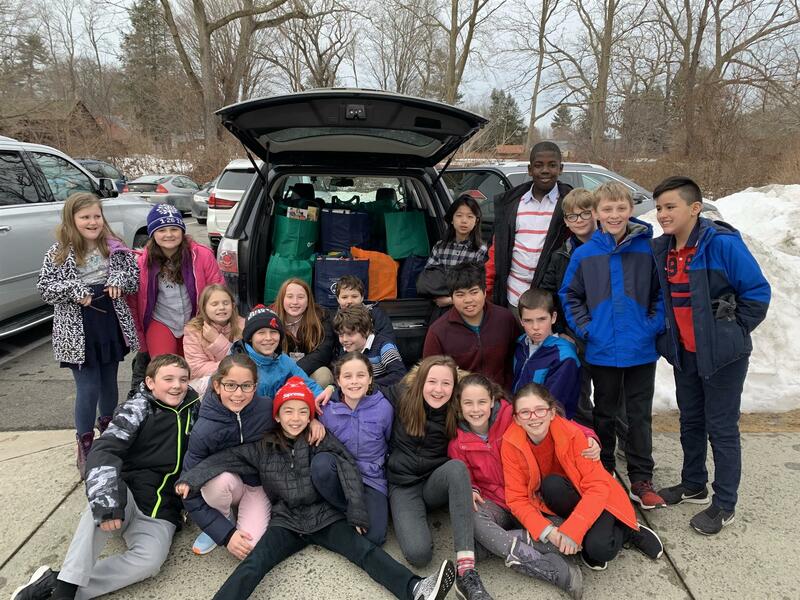 Phelicia Howland P'21, the Banas-Chen '28 family, and Bement fifth graders helped to organize this effort and transport all bags. We're proud to be a part of such a generous community! Enrollment materials were sent February 1. Please return the enrollment materials to the business office and re-enroll in Smart Tuition by February 15. We anticipate having wait lists for numerous grades and for boarding. Let the business office or admission office know if you have any questions. The PA's annual Family Fun and Fitness Party will be at Deerfield Academy's athletic complex and new field house on Sunday, February 17, from 2:00 to 4:00 p.m. Bement students and their families are invited to swim, ice skate (please bring a helmet and skates), and play basketball. Siblings are welcome to attend. Please park in the lower parking lot near the Morseman Tennis Pavillion (#22 on the map) (accessible around the construction site off of Old Main Street, below the pool and squash courts). Questions? Click here to email the PA.
Refreshments available in the Team Meeting Room next to the Hale Gym. Students who wish to attend the lacrosse clinic fundraiser at 1:30 (see below) can head over to this Family Fun and Fitness Party afterward! On Sunday, February 17, from 1:30 to 3:00 p.m., the Deerfield Academy girls and boys lacrosse teams are offering a clinic for children of all ages in memory of Lindsay Crosby, a former Bement faculty and Deerfield community member who passed away this past summer after giving birth to her third child. This event at the DA Athletics Complex indoor turf is donations-only with all proceeds benefiting the Crosby family. No lacrosse experience necessary. To register for the clinic, please email Allison DiNardo, Girls Varsity Lacrosse Coach at Deerfield Academy. Afterward, we encourage you to head over to the Family Fun and Fitness Party for some more activities with Bement friends! This term's eighth grade drama class will be performing a comedy for which they are in need of superhero costumes. If you have a Batman, Hulk, Wonder Woman, Spiderman or Aquaman costume that you would be willing to lend to our performance, we would be grateful. Please email Casey Ahern at cahern@bement.org. We need all the costumes by Friday, February 22. Junior Camp is now full during both session 1 and 2. Spaces are still available in Adventure Camp and Digging Into Nature at Pine Hill. Don't miss out on the fun this summer! Visit our news section for the next Bement Blog post, Reflecting on Black History Month, by Nancy Ames, Upper School English and Global Studies Teacher. The menu for the week of February 11 is available on the Parent Portal of the website. Click here to access the menu. On Tuesday, February 12, third graders will perform Big Brad Wolf by Karleen Haydenon in the Barn at 8:10 a.m.
Valentines must go to ALL students in your class. If you choose to give valentines to children in the other homeroom class in your grade level, please include all students in that class. You may also send valentines to anyone in any grade or to any teacher in the school. If you would like to bring a sweet treat to school that day, please check with your teacher first. Please remember that we are a nut-free campus! On Friday, February 15, the third grade will be going to the Amherst Cinema for the second installment of the See Hear Feel Film program. Students should bring a bag lunch. Bag lunch guidelines can be found on page 42 of the Family Handbook. Lunch Bunch volunteers on Friday, February 15 will be Berté and Pearson, Gagne, Gauthier, McGuinness, Paasch, Schatz. Thank you! There are still spaces remaining in Ms. Craig's program during March break: "Wandering the Wild: A Journaling Journey". During the week of March 11-15, students in grades 2 to 5 will be exploring Historic Deerfield, playing games, and capturing their experiences on the pages of students' very own field notebooks. Please head to our website for more information and instructions on how to sign up! Bement will host a Girls on the Run team again this spring for the fourth season in a row. Girls on the Run is a program for third, fourth, and fifth grade girls that encourages girls to recognize their individual strengths and celebrate connections with others. Physical activity is woven into the program to inspire an appreciation for fitness, healthy habits, and life skills like treating others with care and practicing gratitude. Registration is now open! Progress reports were posted to the parent portal on Thursday, February 7. If you have trouble accessing the report, please contact Emily Rich at erich@bement.org. If you plan to give valentines, they must go to ALL students in your class; please be considerate of all students' feelings. If you would like to bring a sweet treat to school that day, you must check with teachers first. Please remember that we are a nut-free campus! Are seventh, eighth, and ninth graders looking for a great place to be on Friday, February 15? Come to the Bement dance! We will have pizza, refreshments, and decorations. The charge for admission is $7, but only $5 if you wear red or pink. The proceeds benefit the ninth grade gift to Bement. Come and join us in the Kittredge Building from 6:00 to 9:00 p.m. and get ready for a fun night of music and dancing with all your friends! While the rest of the upper school is at the dance on Friday, February 15, all sixth graders are invited to the Hadley mall for roller skating at Interskate 91 from 6:15 to 8:30 p.m. Admission is $14.95 and includes admission, skate rentals, Laser Blast, and soda. For more information, please refer to the email from PA class rep, Jasmine Balk, sent on January 26. Our first annual upper school winter concert is on Tuesday, February 19 at 6:30 p.m. The upper school band, chorus, and orchestra will perform several selections in the Barn. All upper school families are invited. We're looking forward to the start of a wonderful tradition! All upper school students are invited to showcase their talents in the Talent Show on Friday, February 22 at 6:15 p.m. in the Barn. The length of the show will be determined on the number of acts. Sign up sheets are posted in the bulletin boards in the upper school for singing, dancing, instruments, magic, comedy, and any unique talents. Students are able to perform solo, as a duet, or group. With advance notice, day students are able to stay after school and have dinner before the show begins. Questions may be directed to Terry Shields at tshields@bement.org. Ninth graders will present their personal monologues on Tuesday, February 26 at 8:10 a.m.
Eighth grade will present Superheroes: with great power comes ordinary responsibility by Ian Mcwethy on Friday, March 1 at 8:10 a.m. Seventh grade will perform the middle section of William Shakespeare's The Tempest on Monday, March 4 at 4:00 p.m. These performances will be in the Barn and all are welcome to attend. If you are not able to be there in person, we will record all performances and will post videos for you to enjoy. The PA has been very busy planning events for February. We hope to see you! Parents and faculty are invited to the Smith College Campus School for an evening of conversation with Imani Chapman, a Diversity and Inclusion Consultant with Romney Associates on Wednesday, February 13, from 6:30 p.m. to 7:30 p.m. Click here for more information. The full school calendar may be found here on the Bement website.